A woman with a past medical history of radiation and chemotherapy for multiple malignancies presented with bilateral, multifocal, elevated chorioretinal lesions associated with vitritis. The differential diagnosis included endogenous endophthalmitis and metastatic disease. Her extensive medical history and ill appearance at presentation in concert with vitritis and subretinal lesions was concerning for endogenous endophthalmitis. Although her vitreous sample was negative, her blood cultures were positive for Nocardia kropenstedtii and Nocardia farcinica. She was started on broad-spectrum antibiotic coverage but had brain lesions on presentation and ultimately passed away. This is the first reported case of Nocardia endophthalmitis in the setting of systemic N. kroppenstedtii infection. Nocardia, a genus of aerobic bacteria with an unusual branching filamentary appearance, most commonly affects immunocompromised individuals. There is a myriad of ophthalmic manifestations of Nocardia from both endogenous and exogenous inoculation. Given the manifold manifestations of its appearance in the eye as well as the comorbidities patients tend to have, Nocardia can be a challenging diagnosis to establish. Here, we present a case of Nocardia endophthalmitis in the setting of a relatively novel species isolate, Nocardia kroppenstedtii. A 59-year-old Caucasian female presented with decreased vision to a vitreoretinal surgeon who noted rapidly progressive multifocal subretinal and choroidal lesions with bilateral vitritis (Figure 1A). She was ill-appearing with waxing and waning mental status. Her complex medical history included small cell lung carcinoma with bone metastases, for which she had received radiation and carboplatin / etoposide chemotherapy, and a history of stage 2 non-small-cell lung cancer, for which she had a right lower lobectomy with adjuvant chemotherapy 5 years prior. Fundus photographs of multifocal chorioretinal lesions using 35° and widefield imaging. The differential diagnosis included metastatic disease and atypical infectious etiology. A diagnostic pars plana vitrectomy (PPV) was performed with intravitreal injection of voriconazole, vancomycin (Vancocin; Pfizer, New York, NY), and ceftazidime, and she was admitted for blood cultures and antibiotic therapy. She subsequently transferred to our institution for further evaluation given the complexity of her case. She was treated prophylactically with vancomycin and piperacillin / tazobactam. Widefield fundus photos were taken (Figure 1B), and spectral-domain optical coherence tomography (SD-OCT) was obtained through one of the lesions, as well (Figure 2A). Ophthalmic ultrasound demonstrated a “double-membrane” appearance of a choroidal lesion in the temporal macula of the right eye (Figure 2B). An MRI of the brain revealed multiple enhancing lesions suspicious for infection (Figures 2C and 2D). Spectral-domain optical coherence tomography through a chorioretinal lesion in the left eye (A). 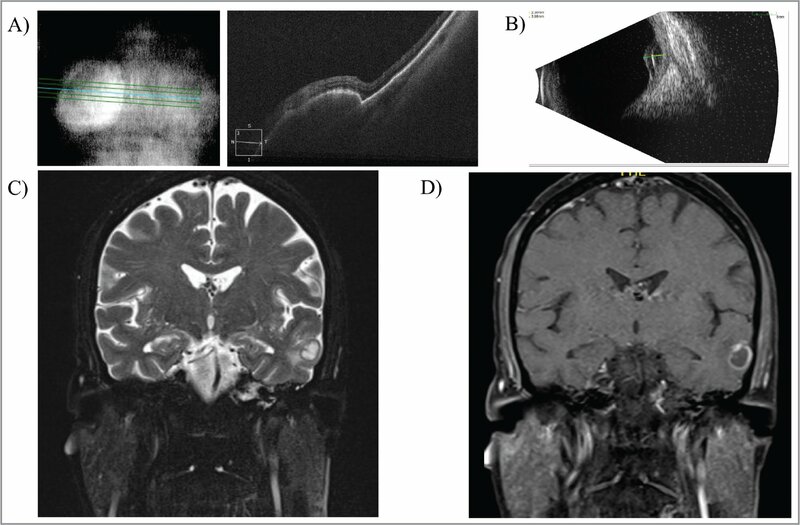 B-scan demonstrating double-membrane appearance of large temporal macular chorioretinal lesion in the right eye (B), and coronal sections of the patient's MRI brain with gadolinium demonstrating a ring-enhancing lesion on T2 (C) and T1 with fat suppression (D) images, consistent with infectious brain abscess. Although her vitreous culture was negative, her blood cultures grew acid-fast gram-positive bacilli, concerning for Nocardia versus Actinomyces. Her antibiotic coverage was changed to meropenem. Speciation was completed 1 week after her transfer to our institution and confirmed Nocardia bacteremia with gene sequencing tests confirming 100% match of both N. farcinica and N. kroppenstedtii strains. We strongly recommended bilateral intravitreal treatment with amikacin that she initially refused, but ultimately received following discharge. She passed away 1 month later. This is the first reported case of endogenous endophthalmitis in the setting of the isolate N. kroppenstedtii, first reported in 2014 in the setting of a pulmonary infection in a lung transplant patient.1 It has subsequently been reported in a patient with brain abscesses and endocarditis.2 The strain is closely related to the other isolate in our patient, N. farcinica, which is often associated with brain abscesses and central nervous system (CNS) disease3 but has been a documented cause of endophthalmitis in the setting of pulmonary involvement, as well.4 Neurologic manifestations of Nocardia CNS involvement vary from subtle personality change and memory loss as in our patient, to significant ataxia, gait changes, and gross abnormalities on neurologic exam as reported in the literature.5 The most commonly identified Nocardia strain, N. asteroides, is associated with exogenous endophthalmitis due to its presence as a soil saprophyte and predilection for warm environments,6,7 but cases of endogenous N. asteroides have been documented, as well.8 It is impossible to definitively ascribe the ophthalmic manifestations in this patient to N. kroppenstedtii versus N. farcinica, but as these isolates are closely related, they should both be considered capable of ophthalmic involvement. Ophthalmic manifestations of Nocardia vary widely and can often confuse the clinical picture because of comorbid conditions. 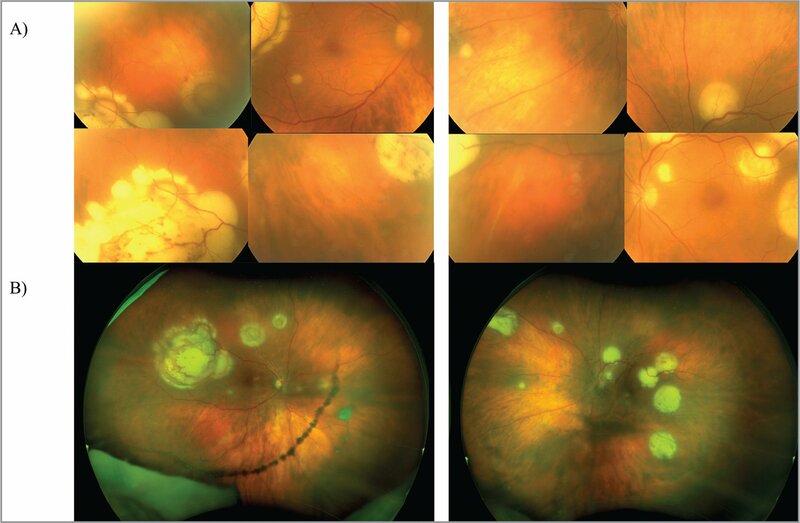 In a case report of Nocardia choroidal abscess in the setting of metastatic non-small-cell lung cancer, the authors were originally concerned for ophthalmic metastases, as was a concern in our patient.9 However, endogenous endophthalmitis secondary to Nocardia commonly presents with subretinal abscesses, as the organism proliferates in the subretinal space; this clinical presentation in a systemically ill patient should prompt an evaluation for Nocardia. In addition to the challenge of clinical diagnosis, microbiological and pathologic diagnosis of Nocardia can also be complex. Albini et al. reported five cases of Nocardia choroidal abscesses in which the clinical manifestations varied widely and microbiological diagnoses were made by positive subretinal biopsy or pathologic analysis of enucleation specimens.10 Three of the five patients in this series had negative vitreous samples and previous reports have corroborated this low vitreous sample yield in the setting of Nocardia endophthalmitis.5,11 The necessity of subretinal sampling for positive ophthalmic biopsy results is likely related to the formation of abscesses that encapsulate the bacteria, with the associated vitritis being mainly due to the inflammatory response. Interestingly, previous reports have noted a lack of helpful diagnostic data from blood cultures.11 However, in our patient, blood cultures in the setting of her other systemic findings were crucial to the diagnosis. In summary, we report a case of endogenous Nocardia endophthalmitis in the setting of an isolate not previously associated with ophthalmic manifestations. Subretinal biopsy for choroidal lesions may generate better diagnostic yields. As an entity that is challenging to diagnose, it is important to consider Nocardia in the setting of immunocompromise and pulmonary or neurologic involvement; however, the prognosis of systemic Nocardiosis is generally poor. Majeed A, Abdullah HMA, Ullah W, Al Mohajer M. First reported case of disseminated Nocardia kroppenstedtii sp nov. infection presenting with brain abscess and endocarditis in an immunocompromised patient with mantle cell lymphoma: Challenges in diagnosis and treatment. BMJ Case Rep. 2017;2017. Mishra S, Damodaran V. Observations on the natural habitats of Cryptococcus neoformans and Nocardia asteroides. Indian J Chest Dis. 1973;15(4):263–271. Chalam KV, Gupta SK, Vinjamaram S, Shah VA. Clinicopathologic reports, case reports, and small case series. Arch Ophthalmol. 2006;119(3):409–410. From Cole Eye Institute, Cleveland Clinic, Cleveland. Dr. Lowder is a member of the Data and Safety Monitoring Board for Allergan outside the submitted work. Dr. Srivastava has received grants and personal fees from Santen, Bausch + Lomb, and Regeneron, and personal fees from Zeiss, Clearside, Eyepoint, Optos, and Sanofi outside the submitted work. The remaining authors report no relevant financial disclosures. Address correspondence to Sumit Sharma, MD, 9500 Euclid Ave, i-30, Cleveland, OH 44106.